American film director Frank Capra died on this day (September 3) in 1991 at age 94. There are those who refer to his films as “Capra-corn,” a reference to the fact that his films will often have themes of man’s basic goodness. But they’re just good films. I dare you to watch It’s a Wonderful Life and not get just a little teary-eyed when James Stewart decides he wants to live again. 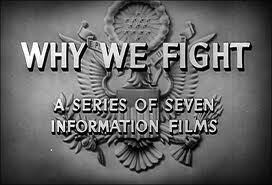 But what has always amazed me was his work on his film series, Why We Fight, created during World War II. I had the opportunity to watch these films in college as part of an Art History class – American Film as Art. Shortly after the Japanese attacked Pearl Harbor on December 7, 1941, Capra – aged 44 – quit Hollywood (and resigned as President of the Screen Directors Guild) to join the US Army. At that time, the Army’s Signal Corps traditionally created documentaries for the Armed Forces. But Chief of Staff George Marshall assigned Capra to create films that “will explain to our boys in the Army why we are fighting, and the principles for which we are fighting …” (from his autobiography, Frank Capra, The Name Above the Title: An Autobiography ; Macmillan, 1971). What was unique about that series is that Capra took EXISTING footage, much of which were confiscated films from Germany and Italy. All he did was change the narration and you get a TOTALLY different film – many of the shots of Adolf Hitler were taken from Leni Riefenstahl’s Triumph of the Wills. Added to that, the Walt Disney Company was enlisted to create some of the animations and Capra had some of the best film composers scoring the films, including Alfred Newman and Dimitri Tiomkin. These were NOT your average Army documentaries. It’s no wonder these are part of the National Film Registry. If you’ve never seen these films – at the very least, Prelude to War – you need to high-tail it to your local library. If they don’t have this series, try to get them through interlibrary loan – it will be worth it. What’s your favorite Frank Capra film?